A dorsal scale of Tsukuyumi, encased in a moon splinter, fell in the bamboo forests of Korea, giving the life there an unstoppable evolutionary push. 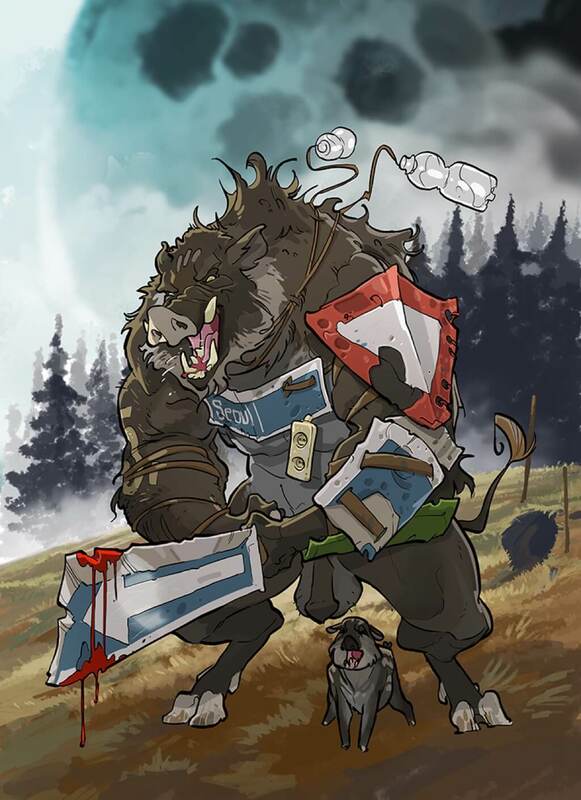 A group of wild boars rose from the mire, developed dexterous hands and high intelligence, acquired complex language and moved out to bring an end to humanity’s rule on earth. The newly strengthened tamed underdeveloped fellow conspecifics and hunted the last surviving humans. Driven by revenge, they showed no mercy. To finally make their triumph over the ancient species visible to all, they plundered their cities and adorned themselves with the metal artifacts of the extinct human world. The fertile Boarmother, the highest of all individuals in the strict tribal hierarchy, symbolizes the rise of the once primitive pigs. Only the strongest and most intelligent boars receive the privilege of fertilization. The flourishing of their family is the Boarmother's highest priority. But before the boarlords could complete their evolutionary development, Tsukuyumi's scales dried out, leaving hybrid beings behind. Trapped between two worlds, the boarlords benefit from the strengths of both. But secretly they know that their path must ultimately lead them to Tsukuyumi, near his life-giving energy, so they can complete their development. The Boarlords are numerous and tough at the same time. One of their advantages is that they can generate new units directly at the front and can turn a harmless fledgling into a huge Boarmaster. Furthermore, they benefit from area modifications, so-called Terraformings, which they can perform round after round. Their tunnels allow them to move easily and quickly between their areas, while their strongholds form strong defenses. The Boarlords are ideal for players who value strength more than speed. Their strategy is to keep conquered areas safe and to strike with all their strength at the decisive moment. They use their high ability to conquer to equalize their lack of destructive potential. The Boarlords aim for a long playing time, during which they can compensate their slowness and show a strong build-up game.